Without much surprise, Real Madrid hosted and beat Eibar 3-0 this Sunday night. 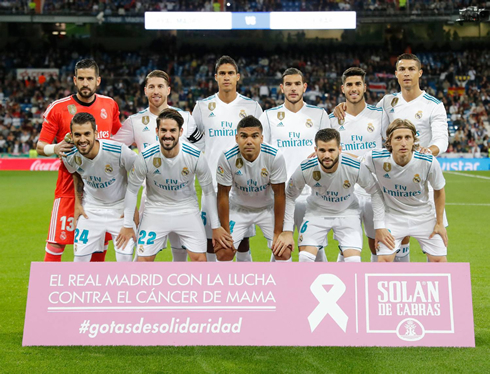 An own-goal opened the can, which was then filled up with goals from Asensio and Marcelo. The 3 points earned this evening will allow the Merengues to continue on Valencia and Barcelona's tale on the top of the Spanish League. 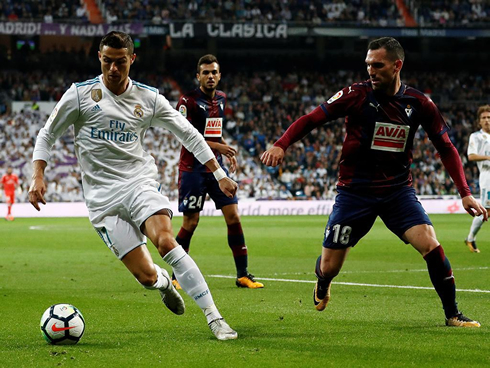 With Valencia, Barcelona and Atletico Madrid all recording victories this weekend, all eyes were on the Bernabéu as Madrid looked to eradicate their poor home form against a struggling Eibar side. And it was a relatively comfortable showing, as Madrid ran out 3-0 victors on the night. An own goal and a tidy finish from Asensio put us up at halftime. And in the second half, a late goal from substitute Marcelo sealed the match. The third goal was an absolute gem... Benzema and Marcelo connecting brilliantly in the final third, right after a great run from Theo Hernandez. Probably the most entertaining moment of the match and a great example of what Karim brings to the attack. In total it was a very interesting game tactically, as we saw some things that have been happening for a while came to the forefront as well. Zidane opted for Casemiro, Ceballos, and Modric in midfield with Isco, Ronaldo, and Asensio making up the attack. Theo and Nacho were the wingbacks as the regular centerback pairing of Varane and Ramos started as well. The build-up was decent if not a bit too timid at times, but the most alarming issue was the connectivity of the team in the final third. Isco and Asensio seem to pass to each other a lot, their bromance on the field is fun to see but it's beginning to come at the expense of the team dynamic at times. Today, it left Ronaldo visibly frustrated on multiple occasions. Ronaldo in recent years has grown used to it, Isco and Asensio are not providing it when they start alongside Ronaldo and it showed today. Often it seems like they are playing their own game, sometimes it works perfectly as it did when Isco set up Asensio for the second goal, other times it ignores teammates in better positions. The performance overall was decent (Madrid were a bit more relaxed after being up 2-0), but often very disjointed. 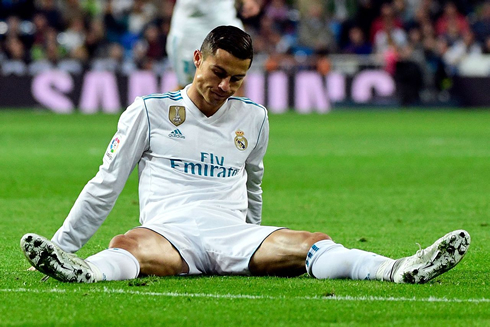 A missed 1-on-1 from Ronaldo in the 66th was particularly depressing for the man himself and you could see him walk off in frustration at the end of the match. Asensio's development is an interesting one, he needs to be confident but he also needs to not grow in arrogance. We have seen some of the early-season praise going to his head at times and he's far too big a talent to make such mental errors sometimes. Still, it was a good goal from him (though the keeper should have done better). Isco, on the other hand, is shining. It's clear he's taken yet another step forward in confidence, he's everywhere on the field begging for the ball and dictating play, however, it's sometimes intrusive to Luka Modric's role as well. 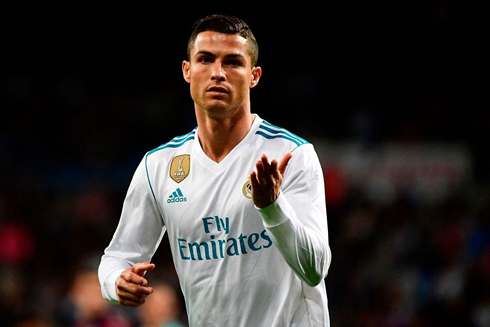 It's also becoming apparent this season that Ronaldo's confidence seems to be a bit more predicated on how involved he feels. You could see an almost defeated look on the Portuguese star's face as he missed his chances, but when he's involved, he tends to be far more clinical. It's still early in the season but certainly, something to consider as we move forward. Onto the Copa del Rey next. Cristiano Ronaldo next game is for Real Madrid on October 26 of 2017 against Fuenlabrada. You can watch Juventus live stream, Fuenlabrada vs Real Madrid, Real Murcia vs Barcelona, Swansea City vs Manchester United, Arsenal vs Norwich City, and Manchester City vs Wolverhampton, all matches provided from our soccer and football live game pages.